Info: Bump Tavern began its history in the little settlement of Batavia serving drovers and travelers along the Schoharie Kill Bridge Turnpike (also known as the Windham Turnpike). 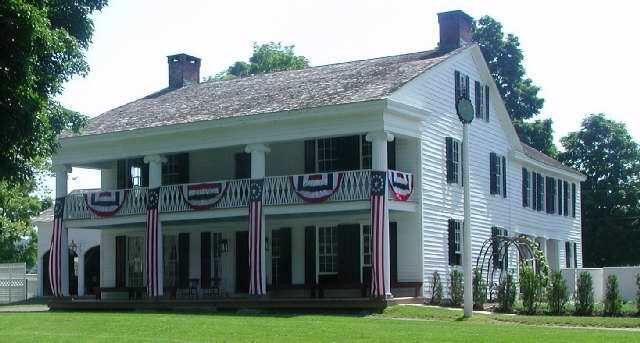 The original portion of the building was built in the Federal Style, but later additions changed the look of the tavern. During the mid-1800s the tavern served as a single family home. Later it became a boarding house for summer visitors to the Catskills. Provenance: The Farmers' Museum obtained possesion of the building from Harry A. and Frances V. Steele of Windham, Green, NY on April 23, 1952. * Harry A. and Frances V. Steele received the property on July 19, 1944 when Emma Tuttle transferred to them the property including the tavern. *Emma Tuttle recieved the property from her sister, Lucy D. Bump's will on July 6, 1943. *Lucy D. Bump recieved the property from her late husband Franklin E. Bump's estate on May 11, 1908. *Franklin E. Bump purchased the property from Clarissa Bump (his mother) on April 17, 1891 for $7000. *Clarissa Bump (the wife of Ephraim Bump) bought Bump Tavern from Addison and Clarissa (Bump) Steele for $4436.72 pm March 11, 1882. *Addison Steele acquired the property from Ephraim and Clarissa Bump (his in-laws) for $6773.38 on October 21, 1874.